This is a speculation post, and nothing more. Don't read too much into it, and take everything I say with a pinch of salt. I'm just sharing cause I wanna. With the up-coming announcement for Morning Musume's 13th generation, and the reveal that the new generation will be made up of Kenshuusei members, my friend and fellow writer, Mara of Fly in the F*ing Wine, wrote her own predictions post for who she would like to see in the new generation, how many, and also the colours they might take on once they are named and shamed. So, because Mara has done it, and because it is fun to discuss these kinds of things, I thought I would do it, too! Who doesn't like predictions and wishful thinking, aye? Now, as I am one of those types of folks who just so happens to ignore the Kenshuusei - and not out of a lack of intrigue, but generally because I am lazy, and / or have no clue on how to follow their progress and activities - I will most likely be basing my ideas of who I would like to see in MoMusu '17, for their looks, and possibly any random trivia I might have come across along the way. Also, despite my lack of knowledge when it comes to the Kenshuusei, I would like to point out that, actually, I am really quite happy with the decision to add pre-existing talents from Hello! Project into their flagship group. Of course, this is only happening because management apparently found no one they liked enough for MM in the general auditions, but it's also a good opportunity for them to debut these girls and make use of their talent, rather than wasting their training like they have done in past years. 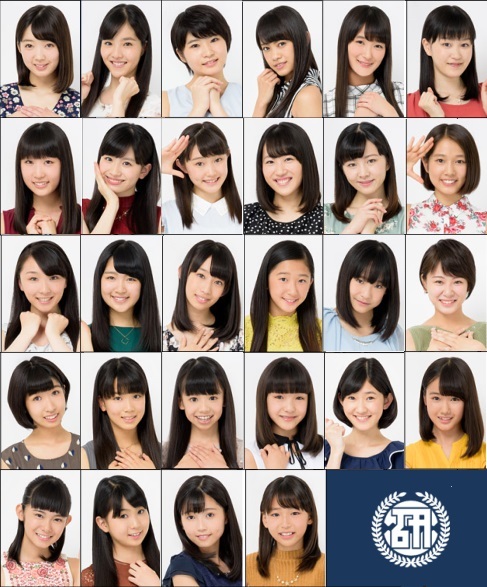 So... yeah, I'm pleased, and I am sure whoever they have chosen for the 13th gen will be good candidates, and will hopefully bring some talent or personality to this semi-floundering groups. First and foremost, I know for sure a good chunk of these girls are already out of the running. Being promised to Tsubaki Factory and all, I highly doubt Management would take some of them out of the group, in order to plop them right into Morning Musume. I mean, it'd be hilarious, it would certainly get the fans saying something... but, realistically, I doubt they would do it. So, already, a bunch of these girls are out. Let's make this easier on me (and you), and visualise jusy who isn't getting into Morning Musume, based on Tsubaki Status. Okay, now that I'm aware of just who has a damn chance, I want to start off with what I want from this generation, as opposed to who I might want. We'll get to that later, but for now, I'm going to steal Mara's system, and give you an idea of what I could only hope this generation will bring to Morning Musume. Talent. As in... basic talent. I may repeat this, but differently worded. ... Or 3 people, because then the group will be at 14 members. Even Numbers. Actually, five would be cool. Wouldn't 5 be cool!? Someone cute. Or photogenic. OR BOTH! Someone who can sing. And dance. And has a personality. A strong personality, because we are actually lacking that (aside from Eripon, Iikubo and maybe Ogata). Someone who will force H!P to get back into the variety game. Someone polished. We don't need no rough gems again, we already have Ogata and Akane for that. Someone older, because it's fun to have girls older than their seniors. Lol. ... And maybe a member who will actually fit their image, or have H!P give MM an image change. That would be cool. Aaaaaaand girls who basically force their senpai to want to be better, because, y'know... threats and all. We never really got that with 12th gen.
... I have more damn things I would like in this new gen than even I thought, but let's be honest; not all of these qualities or traits will come into play, because... well, just because. I mean, I have no damn hope for more variety gigs, nor do I think H!P will change up their poorly chosen 'cool, mature' image for the sake of one new girl or three. 5 would be cool, though. In terms of the numbers given... I really don't give a damn how many girls come into MM. I mean, sure, it would be nice to see the group grow even bloody bigger, but given how terribly H!P are handling them - in terms of picking a centre, figuring out choreography, attempting to push the 12th gen after two years of ignoring them and not knowing how to utilise them - I really do not have any high hopes for them making MM too big, especially when you consider just how poorly they are trying to push 1/4 of the 12th gen, after so long. But, I do hope that, with this new gen, 12th gen will finally do something and start standing out more. It will be nice to see a threat come in, if a threat appears, that is. And, yeah, I want talent here. As in, seasoned, refined girls who can sing and dance - they don't even have to be as great as Sakura in voice or as sharp as Eripon in dance, just... good and stage ready - but, I do think they need someone who can stand on their own and shine, and work without the aid of their seniors. I think MoMusu needs that most right now. There is no need for a new generation who are dependant on the other members, but a generation who are so independent, they will essentially make the other members realise "... aw, shiet, these girls mean business. Better start working for my position!". For me, that is a key thing; that this new generation really keeps MM as a whole on their toes. They really don't need girls who want help, but girls who can help MM as a whole, and will allow them to grow beautifully by bringing back that much-needed competitive streak. WHOA-KAY, now that that's over and done with (because I have little else to say, and I am pretty sure I'm running in circles), let's take a look at some of the members I would ~hope~ might get in... mostly because I like how they look, or because their trivia has appealed to me. A rather seasoned Idol, Kurumin has a pretty solid history as a performer. Formerly a member of Tochiotome25, Kurumin was active from 2011 until 2014, and then joined the Hello! Pro Kenshuusei in 2015. She also has experience in acting, and has been in five stage plays, and a television drama. She has expressed previously that she would like to join a group similar to Morning Musume, and her future goal is to act. Of all the members I have looked at, I actually really do want Kurumi to debut the most. She seems to have a lot of drive, her resume looks pretty damn stellar, and the experience she has gained from being an Idol prior to joining the Kenshuusei is inspiring. I think, of all the Kenshuusei, Kurumi might be the kind to invoke fire and spirit into the other members, so she would be a good candidate for MoMusu. Plus, being seventeen and all, this is Kurumi's final chance to join a group... unless H!P upped their age restriction (but, we know they won't). This girl shines, pretty much, and whilst I do find her wide-eyed gaze quite off-putting, I feel like she would be the sort who would fit quite well into MoMusu. So, yeah... ADD HER! Oh, and for her colour, I'm going to say that Kurumi should ~maybe~ be a red. She has quite a dominating aura, plus, it would be a nice nod to the colours of Tochiotome25, right? One of the newest trainees to join the Hello! Project fold, Shiori joined just this year, and has no prior experience in the entertainment industry. She has, so far, only been in one stage play, but seems to be a determined girl who wants to make others happy. I really don't want many of the newest Kenshuusei to debut, only because it feels like more work for management, and more shoving girls who can't dance or sing as well into the back. But, for some reason, I like Shiori... at least, in looks. She's adorable, and though she looks quite plain, I think she could possibly be a dark horse for whatever group she might debut into. Personally, I would like to see her in MM, because it feels like she would become a little sister figure, and also a future threat. ... I could be wrong, though. In terms of a colour she could possibly adopt, I would probably say a pink, or another purple tone. Maybe in-between. It's an innocent colour, and I think it would befit Shiori well... or, she could be white. That could work. One of the more well-known Kenshuusei, Ruru is a seasoned trainee who joined the company back in 2013. She originally auditioned for the 12th generation of Morning Musume, and is a graduate of the Actor's School Hiroshima. Though she has not really been in any stage plays (that I know of), she has been featured in magazines, and has also opened for some Hello! Project acts. From what fans have said, Ruru is quite talented, and can sing pretty well. Right now, it seems that she is pretty set on Morning Musume as a group that she would like to join, and seems to have a lot of goals she happily strives towards. I think it would be a bit of a crime if Ruru didn't get into MoMusu. She's definitely hard working, and she has been improving herself for three years now since she first auditioned for the group in 2013. Also, from what I know, a lot of people do like her - she has a great presence, apparently, and can sing well. Plus, from what I have heard from others and read about her, it feels like Ruru is the sort who might pose a bit of a threat to MM's current lineup; and I like that. I've said it before, and I will say it again: Morning Musume need someone - or a few members - to give them a reason to better themselves, and if both Kurumi and Ruru got in (or one of them), I feel they would do just that. Ruru is also at a good age right now where she could easily join the group, but still not be treated like a cute little kohai. I think she would bring an air of seriousness, too, and probably a bit of class. In terms of a colour I think she might adopt... I would say, maybe, yellow. We need another yellow, and her aura feels quite bright, despite her demure appearance. Okay, three girls isn't a lot, but honestly, these are the members I am getting MoMusu vibes off of. For the sake of special mentions, I do think that someone like Ichioka Reina would be good for the group... and also because it's one of her final years to get this chance and take it. I would say Kaga Kaede and Inoue Hikaru, too, however, I feel like Kaede would fit Juice=Juice or even Country Girls more, and Inoue would look nice in CG, too. They don't look like MM girls, but, hey! You never know. And if she wasn't already 18 and probably out on her ear in a few months, I would have loved to have seen Horie Kizuki in MM. She looks like she would have fit, and she would have certainly brought an ounce of maturity to the group in her overall look. Maybe down the line, I'd like to see Kanatsu Mizuki in MoMusu, as well as Kodama Sakiko For now, though, I think [they] - more so Kanatsu - might need to grow as performers and Idols. *On a side note, I've been informed that Kodama Sakiko does have a background in both training and performance from a young age. So, she would probably be a really good candidate for MoMusu, given her background, and would probably also lend a hand to making the group work harder as a whole to compete with her. So, if she happens to get in this time around, I will be happy with that decision. And then, in terms of who I wouldn't like to see (y'know... the OH-GAWD-NOPES! ), I'm going to throw in Yonemura Kirara, Kiyono Momohime, and basically every new Kenshuusei member from 2016, aside from those that I have mentioned above. I feel like, firstly, these girls do need to grow. Secondly, older generations need a chance to debut, and, thirdly... Kirara freaks me out. Pretty sure she's going to be a wonderful Idol in the long run, but right now, her dead-eyed doll look is creepy, and I can do without that in PV's. If I wanted a girl like Kirara on my screen, I would watch a MomoClo Z MV. Nope, nope, nooooope, GAAAWD NOPE! And this applies to Ono Kotomi, too! YIKES! ... Yeah, I think that's it! Let's wrap this up, people! From what you can see, right now, I'm pretty set on just three girls, if only because I don't know the Kenshuusei that much. But, really, I think three new members would be a decent amount, and it would even out the numbers. In general, though, just anyone from the existing Kenshuusei could be added. Everyone has a redeeming quality that would (probably) be beneficial to the current lineup of MM, however, it would be nice to especially see a generation that includes at least on girl who could pose a threat to not just one or two current members, but all of them. MoMusu, as a whole, has become pretty lax I think, and the members are comfortable with one another. We need a new dynamic, and we need someone who can screw with the system and throw a spanner in the works. Of all Kenshuusei members who could do this, I feel like either Kurumi or Ruru especially could achieve this. Well, if management let them. Regardless of who is chosen, though, I do wish the new members luck, and that they can bring something great to the group they will soon become a part of. I hope the fans accept them with open arms, and I truly wish that they are going to be one of the reasons why Morning Musume should begin to step up their game come the New Year. What are your thoughts on the up-coming generation, and who do you want in the group? It will be interesting to find out. Until next time, everyone. Take care and good night! Ah, fudge muffins, I forgot the Hokkaido Kenshuusei, didn't I? OH FREAKIN' WELL!